Easements are generally granted for a very specific purpose and can be either appurtenant or in gross. An easement gives one person the right to use another person's property for a specific purpose. 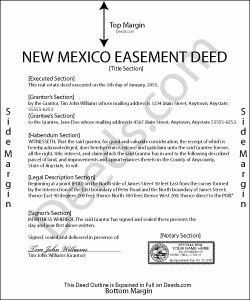 In New Mexico, express easements are common, and are created by a deed, contract, or other written instrument. The easement deed should identify the location and dimensions of easement, the duration, the scope, and the parties who may use the easement. In a conveyance of real estate in this state, all easements, privileges, and appurtenances belonging to the granted estate are included in the conveyance, unless the deed states differently (47-1-34). A land use easement in New Mexico is a holder's non-possessory interest in real property imposing any limitation or affirmative obligation for the purpose of retaining or protecting natural open space values of real property (47-12-2). A land use easement can be created, conveyed, recorded, assigned, released, modified, terminated, or otherwise altered or affected in the same manner as other easements created in this state. A solar right, defined in the New Mexico Annotated Statutes as a right to an unobstructed line-of-sight path from a solar collector to the sun, is considered an easement appurtenant (47-3-8). A statutory form for a declaration of a solar right is offered in 47-3-9 of the New Mexico Annotated Statutes. Easement deeds should be signed by the grantor or the grantor's lawful agent. A proper acknowledgment is required in order to have the instrument recorded by a county clerk. Any person empowered to take acknowledgments, whether in New Mexico or in another state, pursuant to the Notary Public Act or the Uniform Law on Notarial Acts can acknowledge an easement deed. Notarial acts should be evidenced by a certificate, signed and dated by the official taking such acknowledgment (14-14-7). An easement deed will be of no effect and will not create any rights or obligations until it is recorded in the office of the county clerk in the county or counties where the property subject to the easement is located (47-12-3). Any person claiming a solar right must record such right and give notice to affected property owners as a necessary condition precedent to enforcing a solar right. An easement for solar rights must also be recorded in the county where the property is located (47-3-9).